This entry was posted in 2018 midterm elections, Donald Trump, Elections, Good News Stories, Liberals/Democrats/Left, Make America Great Again, Republican Party, Taxes, Trump Derangement Syndrome, United States, US Presidents and tagged Brett Kavanaugh, Chuck Schumer, Mitch McConnell, Neil Gorsuch, Senate Democrats, Trump's judicial appointees. Bookmark the permalink. Excellent! This just makes my day! Great. Now all he has to do is fire the entire FBI, DoJ and Sessions. Then the prosecutions can begin. If that doesn’t happen soon you’ll be looking at “President Pence” and a giant celebratory wallow down at the swamp. This is wonderful news! Thank you DCG! And thank you DJT! Betcha McCain is fuming! BTW How much is this pump and circumstance costing the tax papers? Cain’t wait till is all over! Sounds like the Hand of God. At this point, I’ll take any good news I can get. 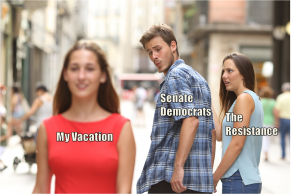 And if these swamp-critters need a vacation, I would be very pleased if they never came back! That being said, I do not agree with everything Mr. Trump does (or fails to do), but, by and large, I believe we can trust him because he has been exhibiting good instincts, for the most part. Now if he can rid us of that MENTAL HOSPITAL known as the 9th Circuit, THAT’D BE GREAT.